Lot:3020 1904 Liberty Head Quarter Eagle. MS-67+ (PCGS). 1904 Liberty Head Quarter Eagle. 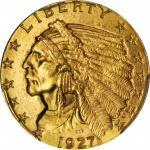 MS-67+ (PCGS).A delightful Superb Gem whose vivid golden-yellow surfaces border on pristine. Both sides are fully struck from the rims to the centers, softly frosted luster also very much in evidence. Although scarcer than the 1903, 1905 and, especially, the 1907, the 1904 is still one of the more plentiful Liberty Head quarter eagles in terms of total number of Mint State coins extant. As with all issues of this type, however, the 1904 is rare in the finest grades and is seldom offered with the quality and eye appeal seen here. Beautiful!